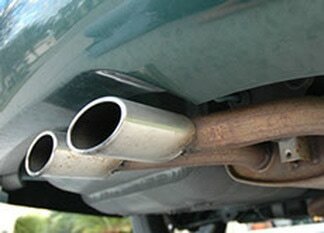 We repair and replace any part of your exhaust system from mufflers to catalytic converters to exhaust pipes. Routine maintenance and repairs on your exhaust system will save you the expense of total replacement. So when you suspect a problem with your exhaust system call us to schedule an appointment at (781) 321-0880 or bring your vehicle by our let our mechanics at Eli & Gary's inspect your system. We are a full service muffler shop open 6 days a week and conveniently located at the corner of Salem and Beach Streets just blocks away from Route 99 and Route 1. We strive to be the best muffler shop in Malden, MA. If you live or work in Malden, Saugus, Revere, Melrose or Everett we are your best local choice as your full service muffler shop. To schedule an appointment call Eli & Gary's Automotive Services today at (781) 321-0880. Your Exhaust System - What Does it Do? The exhaust system of your vehicle is made of different components to remove poisonous gasses and odors from the exhaust of your engine while muffling the noise your engine makes. With so many components that make up an exhaust system a routine inspection should be performed. Typical inspections include the inspection of the muffler, exhaust manifold, exhaust pipes, catalytic convert, and pipe hangers. Get an inspection today! It could save you money if you need to replace an exhaust component versus replacing the whole exhaust system.